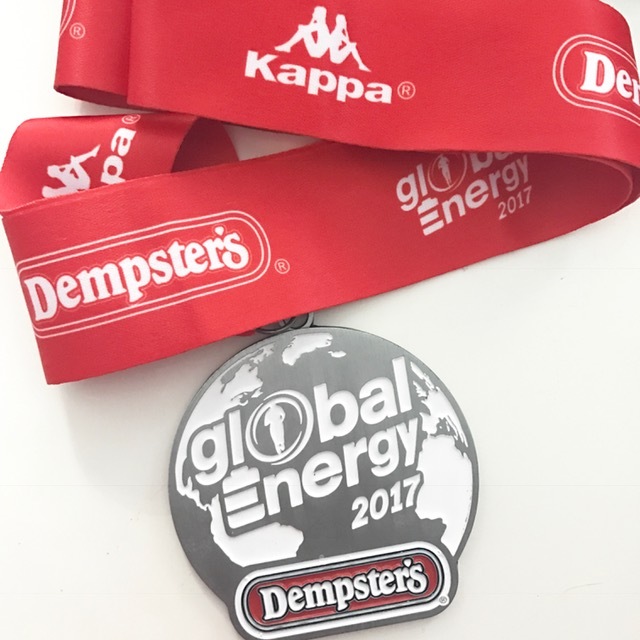 I was excited for the Global Energy Race by Dempster’s on Sunday and planned to race it. 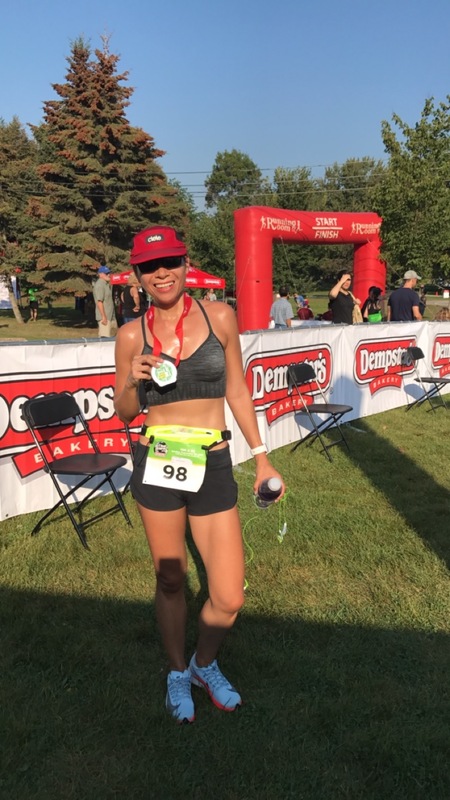 I haven’t tried to PB in a 10k race in years so I was curious to see what I could do (although I wasn’t sure if I could beat my current PB of 47:51). I also thought it was a good opportunity to see how I felt for my upcoming Chicago Marathon (in 2014 I PB’d in Chicago and it’s still my fastest marathon). But as luck would have it, after my speed work on Tuesday night with Nike, I noticed my nose was running. And, sure enough, on Wednesday, I woke up with a full-on cold. My cold did not let up at all by Sunday, and I was very tired and congested. I’d had zero time to rest as I was on an overnight trip right before the race (I’d gone up to Blue Mountain to check out the first Creemore Springs Oktoberfest at Blue). My legs were still sore from the speed work (it was a very tough night of track work!). And when Olympian Adam van Koeverden (and Global Energy Race ambassador) lead all the runners in a warm up, I couldn’t even bear the thought of lifting my knees high because I was so exhausted so I didn’t warm up with the crowd. Add that it was very hot (I think it was 25C but that’s not factoring in humidity) and I knew the race would be rough for me. My plan was to run the race as a tempo, which, dialing back my expectations (given my cold and the sticky humid weather would slow me down) I figured I could finish in 55 minutes if it went well as I could hope for. 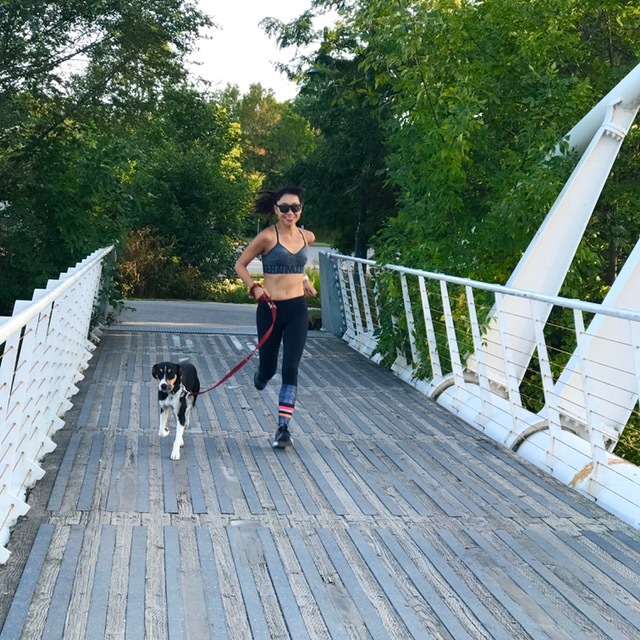 I also threw caution to the wind and tried out two new pieces of gear that I’d never used before: the Nike Zoom Fly shoes and the Nike Lean Runnign Waistpack. That’s a no-no (to try new things for race day) but I was pretty confident they wouldn’t cause me issues, and I’m keen on testing them out as much as possible to see if I want to use them in Chicago. Given I had zero energy leading up to the race, I barely looked at the race info and had no idea what the route was, and I hoped it was not two loops (it was not). For the start corral, I went into the middle of the pack given I planned to run comfortably hard and I wasn’t aiming to PB. But once the race started, I quickly discovered that I was faster than most of the people I was surrounded with. 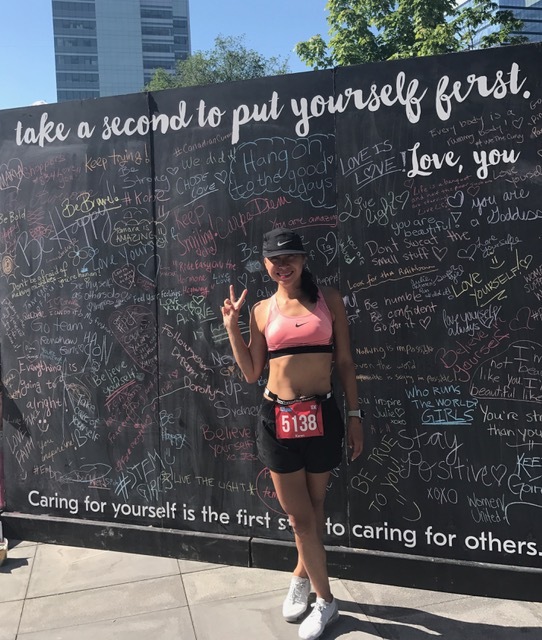 As I worked my way forward, I could see there were not a ton of women ahead of me since I could see the runners when the route looped back, so I felt like I was doing decently even in my congested state. I didn’t push myself to run so fast it hurt or that my heart would explode out of my chest. I recognized I needed to give my body a bit of a break. So how’d I do? I crossed the finish line with a chip time of 52:50.6. I finished 5th out of 26 women in my age category, 15th out of 114 women, and 50th overall. And I’m pretty stoked with those results given I was down and out with a cold and the weather was awful for racing. And how can you not love small races: I feel like if I’d been healthy, I could’ve gotten into the top 10 women. Makes me keen to do this race again next year! 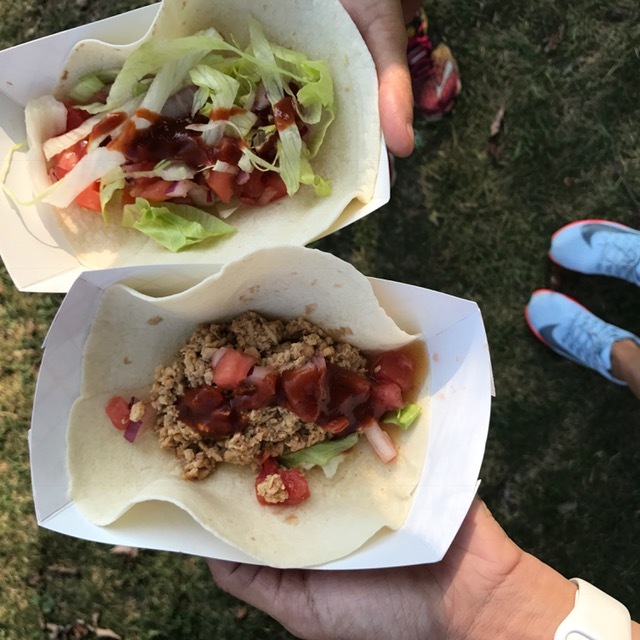 Another reason I’d be keen to do this race again: there was one of the biggest spreads of food I’ve seen after a race: a taco truck! Brunch foods like French toast (with berries and whipped cream to top it with) along with two different breakfast sandwiches! Hot dogs! Hamburgers! Juices! Coconut water! And let’s not forget the table with a huge range of packaged snacks that you could help yourself to. Snacks for days! Two ways I think the race could be improved: the race results need to be clearly available on the race sit. They currently are incredibly difficult to find. I googled many times, and finally after many attempts I found them on the site RunSignup.com (although the results have the race as being in Hamilton!). Secondly, there needs to be a better way to manage both the 10k race and the 3k race: for a certain period of time, with the start of the 3k race starting and going in the direction of 10k runners finishing their race, 10k runners had to contend with a big wave of 3k runners and walkers coming in their direction on the very narrow path, and those 10k runner were directed into a skinny little chute on the side where there was grass underfoot to finish their race. As I stood there to cheer my friends in, I saw many 10k runners confused as to where they were going (as it wasn’t very clear that this grassy chute would bring you over the finish line). The adorable Bimbo mascot (of Grupo Bimbo, the Mexican bakery company) was there dancing up a storm, too, even in the intense heat and humidity. Props to Bimbo! 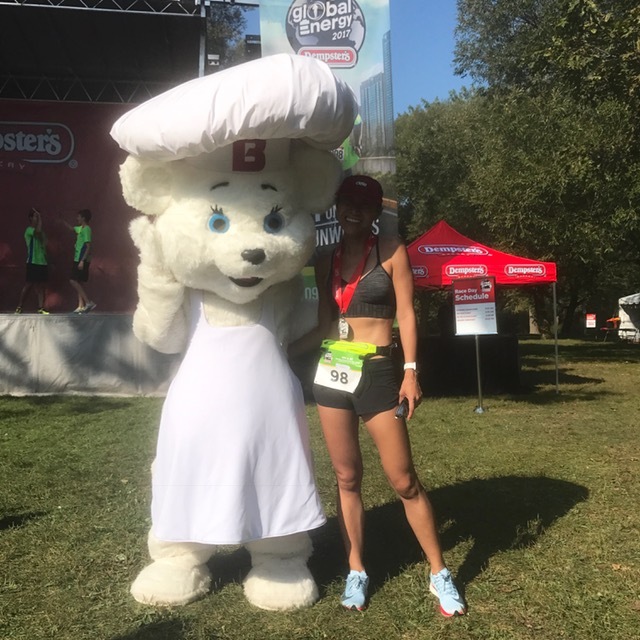 Thank you, Dempster’s, for the chance to take part in this race that helps to provide food to those in need and aims to encourage active living. Now, Chicago Marathon is in less than two weeks, and I suppose I’m thankful the cold came now rather than right before that race! Eep! 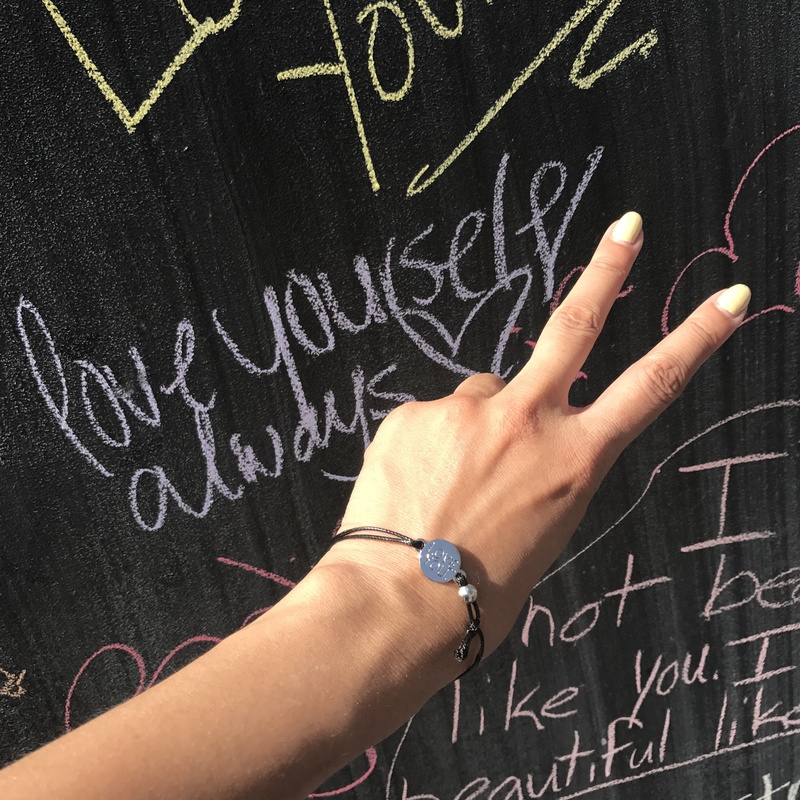 , which took place on June 10th, and given that it’s in support of a cause I think is important — women’s mental health programs — I agreed right away. I had missed running the race last year as I was out of town, but I did run it the year prior and had a lot of fun. I wasn’t planning on racing it, but to run it for fun. I’d taken a long break after running the Barbados Half-Marathon in December, and was only running about once or twice a week for several months, so my pace has gotten much, much slower. Although I have been training more consistently for the past month or so, it’ll take awhile til I get close to the running shape I have been in before. So my approach to this Run for Women 10k was very relaxed. I didn’t stress leading up to it. I wasn’t even quite sure where the race start was when I looked it up at 9 p.m. the night before. I also didn’t get my nails done for it. I KNOW. I never race without my nails done! My friend and fellow iRun colleague Anna Lee agreed to do the race as well and we met up before the race started. Saturday turned out to be a sunny, hot day, I believe it was about 18 degrees when I stepped out to head to the race. We started the race together and my plan was to run it as a tempo, that is for it to feel comfortably hard. Anna Lee was faster and I knew I had to dial back my pace or I’d be miserable and hurting the entire race (and I had zero desire to feel that way) so she went ahead and I could see her about half a block ahead of me most of the race. There is little support along the route. Much thanks to the cheerful volunteers smiling and encouraging runners, and thank you to the man standing at Queen’s Park with a neon bristle board sign that read “You are a life-changer.” Because it’s always nice to have a reminder that this is about furthering such an important cause. As for the route, it was flat and interesting enough as it was through midtown Toronto so stores and buildings for scenery. Because I’d only glanced at the map, I didn’t realize until during the race that the 10k is the 5k route done twice. I spent much of my time behind one runner, who each time I’d catch up to her, she would speed up. In fact, after the race, she found me and thanked me for helping to pace her, haha! That’s another favourite aspect of this race, it’s a pretty friendly, feel-good kind of race. Oh, and the medal is a cute bracelet that reads Love You. Because I had zero plans to aim for a PB, I didn’t work my way to the front of the corral for the race start. But I wish I had, because when I looked up the results, the results are based on gun time, not chip time! Doh! Oh well. In any case, I finished in 54:01 gun time (which is about 30 seconds longer than the time I recorded on my Nikeplus, which is 52nd out of 291 runners, and 29th out of 229 women. Which I’m fine with, I actually expected to be slower, and there was the hot temperatures that day, too. How I’ve run the same distance about 7 minutes faster boggles my mind…but it’s helping to inspire me as I have to kickstart my Chicago Marathon training soon and it’s nice to remember that it is possible for me to run a much faster pace. I just have to put in the training. I’d be remiss if I did not mention the very generous swag bag. 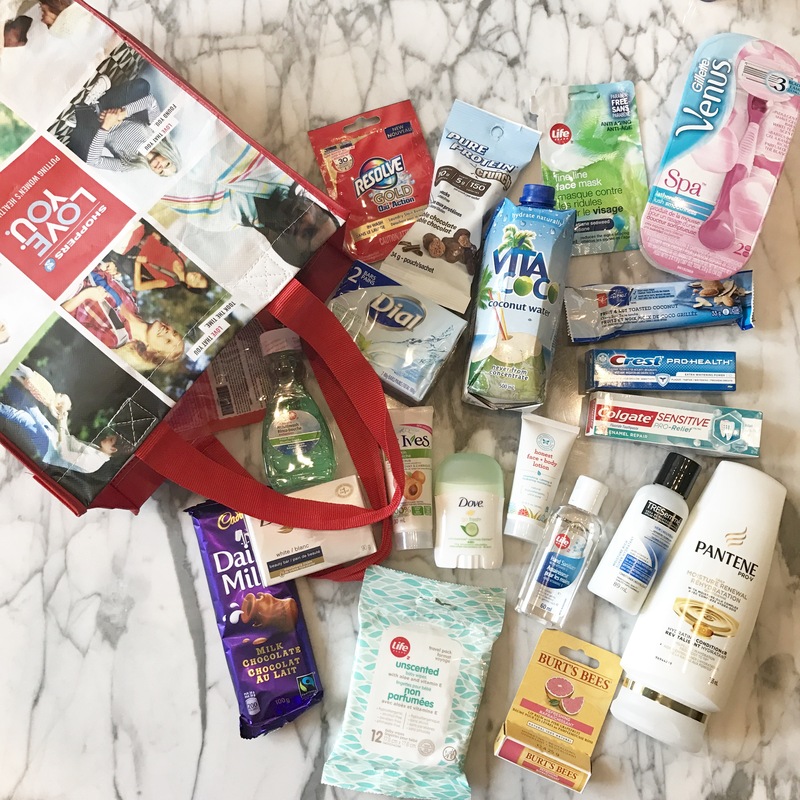 I don’t think I’ve ever seen a swag bag like this before. I stuffed it into my backpack for the 4k walk home from the race, and it legit started to hurt by back, it was that heavy! If swag is a motivator, ladies, you need to get in on this race next year. We’re talking full-size hair products and chocolate and more. This photo doesn’t even feature every item from the bag. 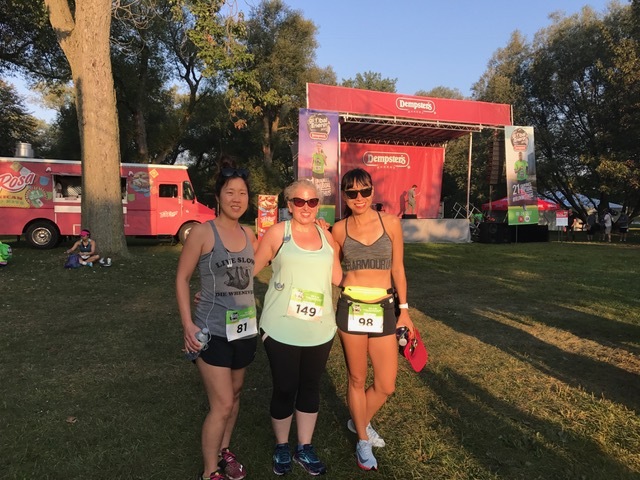 Congrats to everyone who ran the Toronto edition (and all of the other cities, too!) 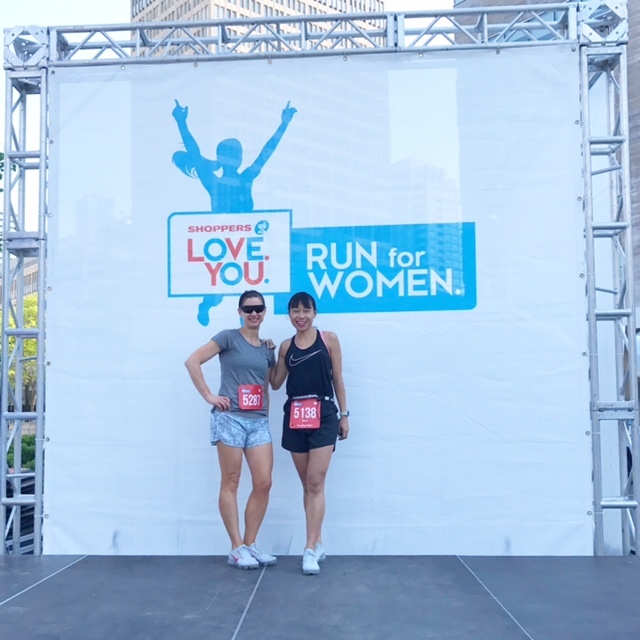 of the Run for Women, and good luck to you in St. John’s running it on June 25th!